Kevan Paul, Clear Lake Fishing Guide, with a spring walleye. Walleyes this size are not unusual on Clear Lake at any time of the year. I haven’t been able to do as much ice-fishing as I would like so far this year. Between Holidays, hazardous travel and such, I’ve just been home-bound more than usual. When that happens, I start thinking, and when I think about fishing, I think of places I’ve been and places that I want to return to. Following are some of those places. Big Stone Lake on the Minnesota-South Dakota border has changed as a fishery in the past number of years. Back in the mid-80’s when I first visited Big Stone, walleyes were the deal, and the walleye population on Big Stone is still very good. Then I went ice-fishing on Big Stone. We caught perch: Lots of’em and nice ones. Perch fishing through the ice on Big Stone continues to be outstanding. I should be out there right now. Most recently, largemouth bass and bluegills have taken some of the limelight on Big Stone. With all these different species available in good numbers, you can almost always find action on Big Stone Lake. Big Stone truly is an outstanding destination for the angler. Learn more about Big Stone Lake at www.bigstonelake.com or call 1-320-839-3284. I should also be ice-fishing on Clear Lake in north central Iowa. Clear Lake is another lake that’s changed greatly, and for the better, in the past decade or so. Clear Lake didn’t used to be so clear, and it also didn’t have the variety and quality of fish that it now does. Water improvement projects have enabled walleye, musky, and panfish populations to increase dramatically. Walleyes are everyone’s favorite, but in Clear Lake, yellow bass are exceptionally popular in open water and through the ice. Yellow bass are outstanding on the table, and you can keep as many as you want. Clear Lake has truly become one of the Midwest’s premier fishing lakes. Check Clear Lake out at www.clearlakeiowa.com or 1-800-285-5338. Fall is smallmouth time on Kabetogama Lake, and when the action turns on, the fishing is hard to believe. Tim Snyder taught us that this is a typical Kab smallmouth. One more fishing location that I have developed a real fondness for: Kabetogama Lake in northern Minnesota. I would enjoy Kab even if it had no fish. Kab is wilderness although it’s not very far away from all the creature comforts. You’ll probably see deer, eagles, beavers, waterfowl, maybe a bear or a family of otters, you just never know what’s around the next island, and most people like that. And, best of all, Kab has fish: Many, many fish. Big ones and eaters. Depending on when you go and what you want to catch, Kab can provide world-class fishing for walleyes and smallmouth bass, and the crappie fishing is pretty darn good also. Add in absolutely jumbo perch and northern pike and you’ve got an outstanding experience. Kab has a great selection of resorts on part of the lake, so you can find whatever you’re looking for in lodging. And then on much of the lake, there is absolutely no development, so there’s lots of lodging for the wildlife that abounds in the area. Go to www.visitkab.com or call 1-844-525-3522 to start your trip. We’re fortunate to have so many wonderful fishing destinations in the Midwest. Lots of fish to catch and lots of other things to do. I am certain you’ll be happy at any of the destinations just mentioned. 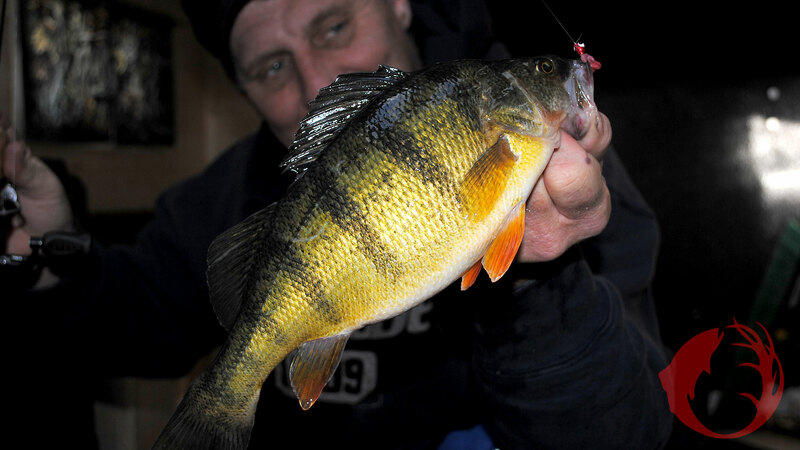 Feature Photo: Mike Frisch caught this jumbo perch through the ice on Big Stone Lake one January day. Big Stone is outstanding whether the weather is warm or cold.